The builder and owner drove the vehicular mash-up all the way from Vancouver, Canada to South Padre Island, Texas. That's 2,570 miles. An RV assembled from a mishmash of former commercial vehicles has been photographed in Texas, and needless to say, we're in love with it. The larger-than-life machine features bits and pieces from a fire truck, a semi-truck, and a heavy-duty wrecker. Facebook user and Doug Poggensee spotted the vehicle on a trip to South Padre Island, a place mostly frequented by tourists and Spring Break partygoers. 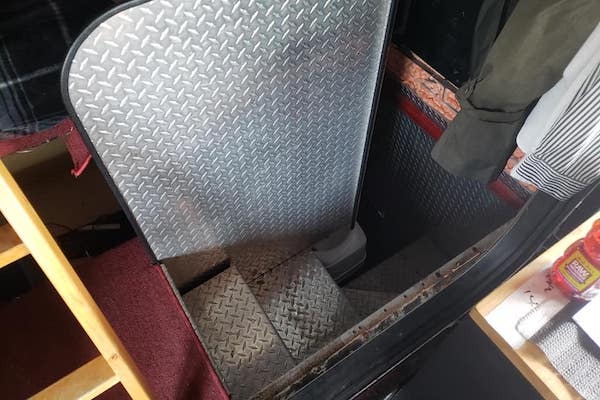 Poggensee shared his photos with a vintage fire engine enthusiast group called SPAAMFAA on Facebook, or the "Society for the Preservation and Appreciation of Antique Motor Fire Apparatus of America." The contraption is built on the basis of a retired fire engine, and the vehicle's livery identifies its past owner as the Rainbow Lakes Volunteer Fire Company of Denville, New Jersey, which states on social media that it operated the truck under the designation Engine 623. Texan TV station ABC South Texas tracked down the vehicle to interview the vehicle's manufacturer and driver, who turns out to be a former boat builder by the name of Brian Portman. Portman told the station that this fire truck-based camper was not, in fact, his first. "My first one, after ten years of building it, three years of use, burnt down," Portman told ABC. "A fire truck that burnt down!" Evidently not dissuaded by the fiery end of his last vehicle, Portman told the station he picked up another engine—this one 25 years old, for $12,500—for conversion into a second RV. He fabricated the fire engine's expanded body using the sleeper from a Peterbilt semi, which he then topped with a Kenworth roof. 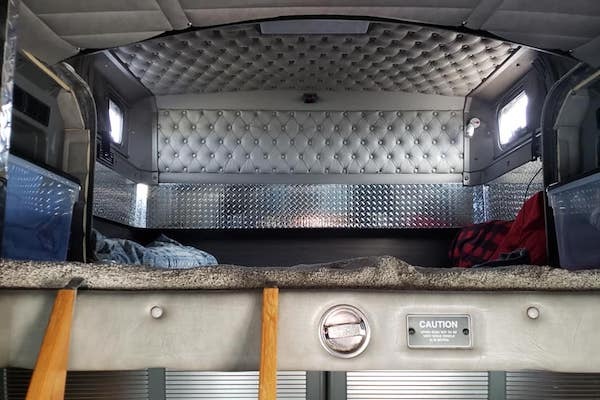 For the cabin's midsection, he incorporated the roof from a Volvo, giving space to stand on the elevated midsection of the vehicle. 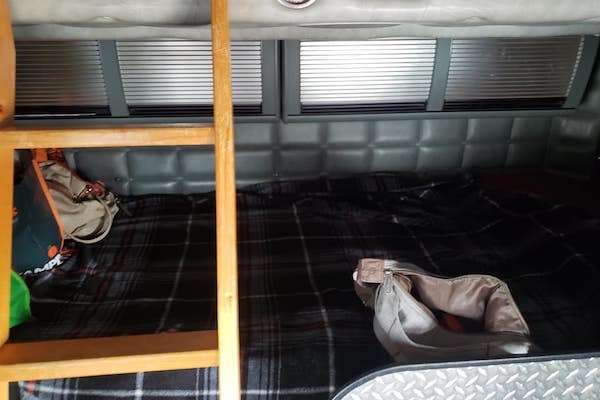 Inside the passenger compartment, a pair of bunks, a refrigerator, and a small stove (for warmth) can be found. Sliding out from the vehicle's side is the stove used for cooking, but that's not all Portman has relocated. He explains that he and his wife don't get along perfectly, and that he brought a Suzuki on the vehicle's wrecker-derived back-end as well as a trailer for he and she to get some space between them as needed. 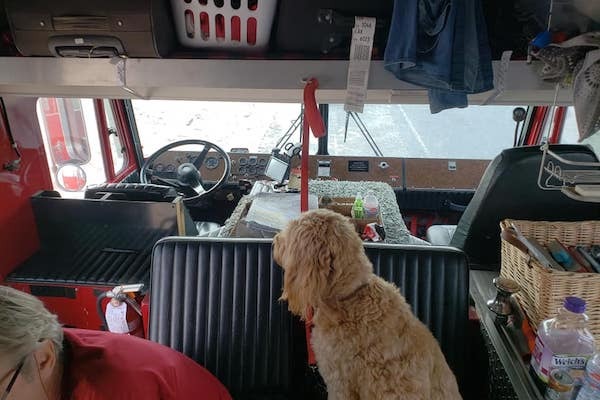 Despite being a hodgepodge of different vehicles, the truck evidently works well enough for Portman to drive it all the way down from Vancouver, Canada to his vacationing spot on South Padre Island, a distance of about 2,570 miles. At an average of 6.5 miles per gallon, that's nearly 400 gallons of diesel just to make the drive down. At a nationwide average diesel price of $2.97 per gallon according to the Energy Information Administration, Portman almost certainly paid close to $1,200 USD for fuel, and that's only for the trip down. At $2,400 round-trip, why not fly instead? You won't get to see as much flyover country, but you won't be trapped with your travel mates' farts for hours on end.